Philadelphia textile artists Shannon Retseck of Cuttalossa and Elizabeth McTear of Honest Alchemy Co collaborate to create unique textiles. They walk us through their process of creating handmade stamps reflecting the classic and timeless style of Pennsylvania Dutch Fraktur illustrations. Shannon graduated from Pennsylvania Academy of Fine Art in Philadelphia with a focus in painting. As an artist her work shifted to a study of craft and interiors. After art school, she managed a small business for a number of years before pursuing her own business selling artisan made textiles and home goods, Cuttalossa, named after a creek and road near where she grew up in Bucks County, Pennsylvania. Much like the tiny creek that has historically connected goods from the surrounding regions to Philadelphia by way of emptying into the Delaware River, Shannon's little company works as a connector of sorts. Elizabeth started Honest Alchemy as a place to experiment, test, and challenge herself. With a well-developed background in the arts, and a BFA in Textile Design, Elizabeth knows the ropes when it comes to working with textile. However, until a few years ago, she had never worked with natural dyes. 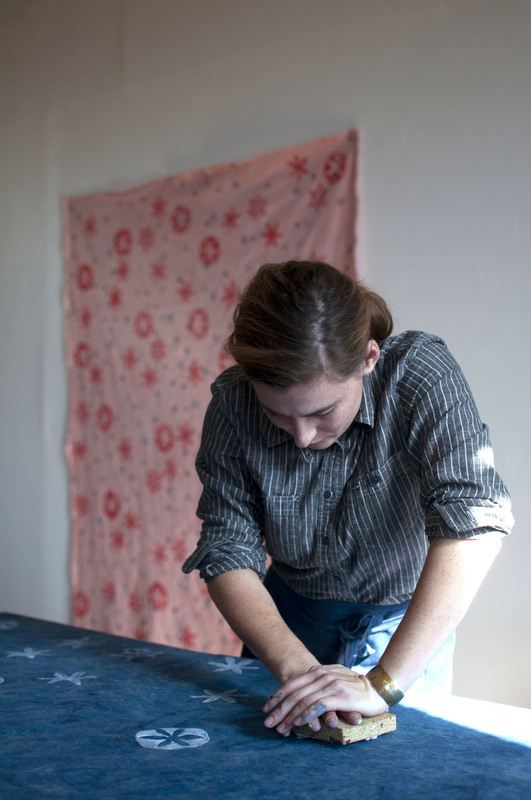 In an effort to combine her passion for fibers and textiles with her desire to operate her business as ethically and sustainably as possible, she started working with organic indigo dye and has slowly added other natural colors to her repertoire. What sparked the idea for this collaboration? Have you collaborated on past projects together? This is our initial collaboration. We met selling our wares at various events in Philadelphia. We both have a love for wholesome natural materials, color, the process, and Pennsylvania. Can you describe the process for making the block stamps? We are both inspired by our Pennsylvanian surroundings and looked extensively at Pennsylvania Dutch Fraktur illustrations. After drawing lots of various Fraktur-inspired designs, we found we were being far too complicated so we boiled it down to the simple stylized floral you see on our textiles. Then it was just a matter of cutting the stamps and getting to work. What kind of paint was used? We use a water-based textile ink for printing. and natural dyes of madder, Fustic and indigo for the fabric itself. What care/treatment was needed for the fabric? We like to focus on utilitarian goods, things that are easy and fun to use, so our pieces are made from organic cotton/hemp fabric that washes and wears easy for our customers. Is this something readers could re-create themselves? Any tips? The stamping part is fairly simple to recreate for yourself: draw a design and then cut the block, roll on ink or paint, and stamp away! However, the natural dyeing is far more complicated and requires dedicated time, patience, expertise and equipment. To give you an idea of what happens for the dyeing: first the fabric must be scoured of impurities (dirt, sizing, etc). Then, depending on the dye being used, it has to be treated with a mordant to help the dye bond with the fiber. The dye vat is prepared, and processes vary depending on the natural dye being utilized. After that, the fiber is added to the vat, sometimes needing regular stirrings for an hour, sometimes requiring overnight soakings. Then it's a matter of washing, pressing and then stamping. Then the fabric is hemmed and ready for sale!